Evolutionists: ‘Ape-girls’ were better swingers! A researcher at the University of California at Davis thinks he may have evidence that we come from ancestors in which the females spent more time in trees than the males. He says that girls in playgrounds spend more time on climbing devices than boys do. Also, he asked children aged three to four about their night-time fears. Where were the ‘monsters’ in their bedrooms? More girls than boys said ‘under the bed’ or similar. If female ape-women slept in trees, the theory goes, they would be ‘genetically programmed to fear attack from predators below’. The researcher thinks this explains why some of his other work has shown that women in some ‘scary’ movies pull their feet up on their chair ‘as if to protect dangling limbs from danger’. New Scientist, August 28, 1993 (p. 9). The ‘scary’ thing is that tax-payers usually have to fund these sorts of profound evolutionary speculations. Evolutionists used to claim ‘proof’ of evolution by pointing to organs such as the appendix, tonsils and thymus as useless evolutionary ‘left-overs’—until advancing knowledge showed they had a function after all. Today’s evolutionists sometimes point to stretches of so-called ‘junk’ DNA in the nucleus of cells in a similar way. The useful hereditary instructions (genes) in living things, written in code on the long DNA molecule, have many apparently useless stretches of DNA interrupting their sequence. It has been claimed that these ‘commercial breaks’ in DNA sequences (or ‘introns’ as they are known) are ‘relics of genes that have become useless’ during an alleged evolutionary history. Now it appears they may have a function after all. Simon Shepherd, a cryptographer (specialist in code-breaking) at the University of Brad-ford, has used computer analysis to show that the sequences on these introns are ‘not random junk, but are largely predictable’. He is sure that these DNA stretches act as proof-reading devices to minimize errors when the ‘useful’ DNA is copied. He points out that in today’s digital transmission systems, there are error-checking systems similarly based on redundant information which are only a poor reflection of these systems in cells. New Scientist, June 26, 1993 (p. 15). When you see some part of a living thing labelled ‘useless’ as an evidence for evolution, this seems to always mean that researchers have not yet found out what it’s for. A group which believes that life once existed on Mars claims the US Government might have disabled the Mars Observer spacecraft in August so the craft could not take pictures of an ancient city on the red planet. Group spokesman Richard Hoagland said two photos taken of the Martian landscape by the Viking probe in 1976 showed a face and a city. The latest NASA spacecraft to Mars lost radio contact before sending back pictures. Mr Hoagland says someone within NASA could have ‘pulled the plug’ so no more evidence of the city would be seen. The Courier-Mail (Brisbane), August 26, 1993 (p. 1). The evidence for a huge shadowed human face on Mars has largely rested on the existence of a ‘city’ nearby. But as we mentioned back in 1988 (Vol. 11 No. 1, p. 5), imaging specialist Gene Cordell found that ‘honeycomb’ patterns which were supposed to be the ‘city’ were actually caused by the film processing technique—they were not on Mars at all! NASA scientists have said the ‘face’ is just a mountain. In Creation magazine (Vol. 13 No. 2) we told you of DNA that had been extracted from a magnolia leaf supposedly millions of years old, even though DNA breaks down quickly in the laboratory. We pointed out in Creation magazine (Vol. 14 No. 3, p.43) that every time DNA is found in specimens allegedly ‘millions’ of years old, this is in fact evidence against those millions of years, as laboratory measurements indicate that DNA should have spontaneously and completely fallen to pieces after only 10,000 years. In Focus (Vol. 15 No. 2, p. 9) we later told of the discovery of insect DNA in amber allegedly millions of years old. At that time we predicted that when some of the DNA is sequenced and compared with similar insects living today (and they are remarkably similar, often identical, as shown in Joachim Scheven’s brilliant ‘Living Fossils’ video) it would be very close, suggesting thousands, not millions, of years. Now it is reported that DNA from a termite in Dominican amber has been compared with its ‘living Australian descendant’ (actually not the same species, but almost certainly the same kind) and after the alleged 30 million years (which if true would mean a huge number of generations and thus mutations) there are ‘only eight’ base-pair differences. The evolutionist researcher comments ‘this insect is highly conservative’. 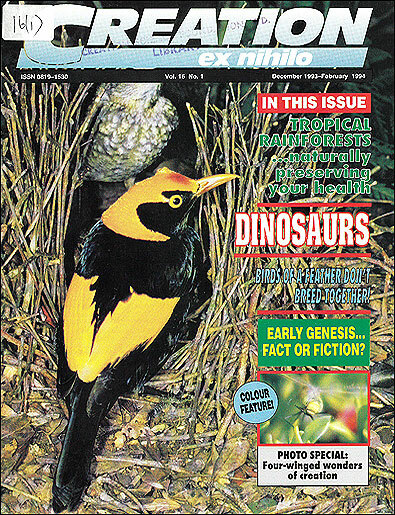 Discover, August 1993 (p. 52). The same article indicates that the vast deposits of Dominican amber (fossilized tree resin) may not have accumulated over tens of thousands of years after all, but may be part of a large catastrophe in which the trees were broken, bled freely and were then buried catastrophically in sediment from further storm action. A School board in Vista, California, has voted that the school curriculum should include the teaching of creation. By a vote of 3:2, board members voted that creation be allowed to be taught in history, social science, literature and science at appropriate times. Evolutionists have predictably been upset by the decision. Nature (Vol. 364), August 26, 1993 (p. 746). A graduate student at the Museum of the Rockies in Montana was examining a thin section of Tyrannosaurus rex bone under the microscope when she noticed visible blood cells, even containing nuclei, threaded throughout the bone. Science, July 9, 1993 (p. 160). Such discoveries obviously help confirm that, in reality, the bones date back only a few thousand years at most. Two German journalists have written a startling book about the famous ‘Ice-man’ found in the Tyrolean Alps. The Ice-man is alleged to be a 5,000-year-old European, preserved by a glacier. The authors cite curious contradictions about the find, one being that other corpses in glaciers have not ended up with the well-preserved, leathery skin of ‘Similaun Man’. The authors point out that the experienced pathologist (since dead) who first examined the corpse believed that it was a ‘mummy’ from another cultural setting which had been ‘planted’ in its finding place (they do not dispute the radiocarbon age). This would fit with their observation that the corpse appeared to be that of a shaman (a ‘medicine man’). His body was covered with ritual tattoos known from other parts of the world. The media have reported that the genitalia of the corpse were missing, presumably broken during relocation. However, the authors seem to substantiate with clear photography that the Ice-man had been castrated during life. They claim that since the corpse was transferred to an Austrian university, scientists permitted access must sign an agreement making them liable for any commercial loss the university might suffer from public statements they make. They suggest this may inhibit researchers from expressing doubts they might have about this ‘earliest European’. M. Hein and W. Nosko, Die Öztal-Fälschung: Anatomie einer archäologischen Groteske, Rowohlt Verlag, 1993. The authors have appeared on Bavarian television with their challenging questions, and have suggested scientific tests to help settle the issue.